We’re just over three weeks away from the start of the 2018 FIFA World Cup (official motto: “No, It’s Not Weird That This Is Happening In Russia, Why Would You Even Ask?”). And how thrilling is it that the United States men’s national team has chosen Philadelphia as the site for the week-long first leg of its training camp? I’m sorry, the charade is too difficult to keep up any longer. It still hurts, thinking about the cataclysmic result last October in Trinidad that saw the U.S. men miss the biggest tournament in sports for the first time in my lifetime. And the U.S. men will be here in Philadelphia next week for a friendly, reminding us of that moment. A friendly that should be part of a send-off tour, but is instead a tune-up to be a tune-up opponent for France in the coming weeks. The World Cup is just weeks away, and yet it remains far, far from the back of my mind. It feels like there’s some pressure in the soccer world to be equally excited for a World Cup without the United States participating. After all, the U.S. were never serious favorites to bring home the trophy, and there’s an admirable culture of “for the love of the game” surrounding football. But it doesn’t feel the same without your team in the tournament. Sure, I may pick up an affinity for Egypt, or Iceland, or Senegal once the tournament starts. I miss, though, the build-up, the sense of nervous anticipation that comes with the slow drip of news about the roster, the first friendly with the squad together, or even just the reveal of the World Cup kit. All of that is missing this summer. There are other factors at play, too. There’s healthy skepticism about the tournament being held in Russia at all, given the ugliness of FIFA politics and that particular nation’s fondness for cheating at pretty much everything. And there’s healthy skepticism about Fox Sports taking over broadcast rights from ESPN, whose masterful handling of the last few World Cups is set to be replaced by an outfit that wanted to make Gus Johnson its lead soccer announcer. For American soccer fans, these next few weeks will be a bitter pill to swallow. And in the Philly area, that pill is walking right up to our front door. Look, I’m not saying there aren’t reasons to be excited about Monday’s match. Caretaker manager Dave Sarachan’s side is quite young and experimental, and it’s a vision of what we’ll expect to see in the next World Cup qualifying cycle. There are some exciting players in the squad — Weston McKennie, Erik Palmer-Brown, Tim Weah are three that should spark some interest. Also, PULISIC! PULISIC PULISIC PULISIC! The Pennsylvania native returning home as the undisputed best player on the national team is a good story, and it’ll be a treat for Philadelphia-area fans to watch him run amok against Bolivia. Any joy from this match, though, will be tinged with bittersweetness — every beautiful move from Pulisic conjuring images of World Cup goals never to be, every shot of Dave Sarachan on the screen a reminder of the arrogance of both Bruce Arena and Jurgen Klinsmann, and every roar from the Talen Energy Stadium crowd but an echo of the larger stadiums that will fill in Russia next month. The loss in Trinidad won’t be erased from the mind until the next World Cup qualification. In the meantime, Monday might be a melancholic evening by the banks of the Delaware. Auston Trusty & Derrick Jones. From a Union point of view, it’s a bit of a bummer to not see either Trusty or Jones get a spot in the young squad that will face Bolivia. Trusty, of course, is having an outstanding season so far for the Union — he’s probably their most consistent player not named Andre Blake, and looks like a veteran in what is a very young back line. It’s tough to argue with Sarachan’s actual choices there, but the feel-good move would’ve been handing Trusty his national team debut in front of his home fans. As for Jones, the disappointment is more that he’s not even in the conversation after a bright start last season that included time at the U-20 World Cup. By all accounts, he’s looking dominant at Bethlehem Steel, and I continue to question the wisdom of not giving him a serious look with the first team. Who wants to play guess the attendance? The timing of this match feels super, super weird — that’s a technical sportswriter term. It’s a 5:30 p.m. start on Memorial Day means that a lot of folks may still be at the beach, and the aforementioned disastrous failure to qualify for the World Cup isn’t going to be much of a draw. On the other hand, this is the first real opportunity to see Pulisic do his thing at home, which should be quite the spectacle. (Watching the kid play live last year was one of my top-five live soccer experiences.) And it should be a perfect opportunity for some Monday afternoon grilling in the Talen parking lots. The wisdom is that simply Curtin views Bedoya, Haris and Dockal as unbenchable. I was bullish on Jones too, but seeing him get a constant 90 minutes in Bethelehem and dominating is pretty much the perfect outcome for now. It does seem odd that he can’t get into the 18 ahead of Creavalle though, and at least be the first defensive sub off the bench to help close out games. It makes perfect sense this way. Why would they waste Jones on the bench for maybe a chance to play when they could guarantee him a full 90 at Bethlehem? Watching him captain Bethlehem as the best player on the field playing 90 minutes to me is more valuable than mop up duty off the bench at this point. One of the reasons they brought the USL team is to develop players and to me that’s on the field not a MLS bench. John P. O’Donnell, Jr. speaks my mind. Recall Earnie Stewart’s repetitive emphasis on game minutes early in his tenure as sporting director. While I deplore James Chambers being hurt, the injury has provided Jones an excellent growth opportunity, one he is seizing as Mr. O’Donnell says. My thing OSC– if Derrick Jones is your future 6 why on earth is he behind James Chambers even if Chambers is better at the moment (for any reason really) on a USL team. Its an affiliate in USL created to groom first team players…not an entity designed to win in USL. I think they were playing Jones as the 8 before because they wanted him to work on his offensive game. Really what Cambers gives you is the ability to play all midfield positions so he shifts depending on the needs of the actual prospects playing. Plus he gives you the vet mindset on the field that helps/corrects/teaches the other players on the field. Going off what A. said, I thought Curtin or someone said long term they see Jones as more of a box-to-box guy similar to Bedoya. I honestly wouldn’t mind seeing Jones come in as a 60min sub for Medunjanin. Harris needs a kick and DJ gets some first team minutes. Win-win! Hopefully this changes as we have seen the value of Bedoya pushed wide right. Plus, you know, squad rotation. A good musician friend of mine said to me once that he’d often have other musicians he knew essentially go missing from the scene for a year or two. They’d be off somewhere working with other groups, honing their craft, or generally just reeneegizing themselves. When they came back, he said, they’d be on a different plateau of skill altogether. I’m taking that wishful vision for Derrick Jones. See you on the next plateau, young midfielder. To me, reacting to the US not being in the World Cup is somewhat of an age issue. I went to my first international match at the Yale Bowl in 1976 and watched three WC’s without the US before 1990. So to me, it’s not a big deal and won’t affect my interest level. Given that it is not a tuneup for Russia, I’m fine with guys like Trusty not playing since I would rather see him play Saturday and Wednesday in games that count rather than in a meaningless friendly. As of now, I’m not planning on going to the game, even though I’m only going to be sitting at home about 5 miles from the stadium. I just can’t see paying the inflated prices that US Soccer charges in order to go to a game to watch a team that did not qualify for the premier tournament. Although the middle sections are bumped up to $75 and more, you can still get in for $28 on the ends. If you use the code EPYSMAY28 off the Union ticket page you can get in for $20 (+fees). It also does about %20 off all tik prices. Christian Pulisic. Say no more. That young man is worth the price and worth the support. I hear you Andy…to some extent. I even went to Mexico for WC 86 as a teen. I can and will get by watching the WC without the US, but it should be well past that, especially given FIFA made it so easy for the US to qualify for the WC with 3 1/2 slots for CONCACAF because it wants the money and media it provides. Quite frankly, it should be well past merely qualifying for it. We need to get past the suburban ‘pay to play’ culture and its smug, think-too-highly of yourself, half-arsed ‘there’s always another match’ approach this team took predictably into a WC qualifying disaster. That starts right outside Talen Energy Stadium in Chester and the surrounding working class areas and others to tap into that key larger talent pool that other nations routinely court. Focusing on young players that might pan out to give the US two or three WC cycles with experience is the smart start with this match that may also develop further meanwhile in the upcoming Gold Cup next year. We didn’t even get the nod for a 2019 Copa America invite after hosting it, that’s how much others have summed up the US until it sorts this problem out. …I am all for missing the World Cup. Guys like Michael Bradley and Jozy Altidore, IMO (-booted— as in– threw up and) should never step foot in an important National Team Camp again…. along with the Dead Generation & Friends of Brek Shea type players that currently have us missing multiple Olympic Cycles and the like. I’ll have plenty of fun watching World Cup and don’t sweat team USA missing one bit, so long as significant roster change results. +2. Got tickets to the match. Looking forward to it. Yes please. More Tyler Adams and friends. Adams took a knock in Atlanta Sunday. Subbed out with an ice bag during the lengthy Kemal Lawrence neck immobilization and evacuation to hospital. Both Adams and Lawrence listed as questionable in most recent MLS injury list update. I’ll be there. 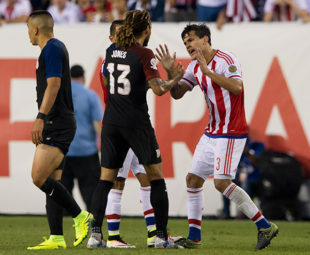 Love the youth roster…other than Pulisic I’ve no interest in investing more time in over-the-hill established players that had little business appearing much if at all during the last WC qualifying disaster and certainly a laundry list of prominent posers that blew qualifying for this WC and the past two Olympics. The only one I’m concerned about including in this roster is Joe Corona. Despite some flairs of talent in the US shirt, he’s been inconsistent, was part of the cycle of failed bids and he’s now 27. Should he be there or is he worth a last chance to either fish or cut bait? nope, not going. My guess is tix are available outside for $10-20 bucks. Not even a full stadium. Just my 2 cents.